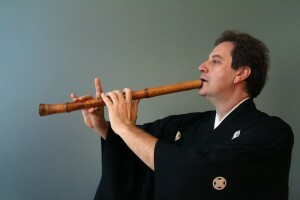 So shares James Nyoraku Schlefer — shakuhachi flute specialist –- on the eve of the New York premiere of Paul Moravec’s new Shakuhachi Quintet. Commissioned by and written for Schlefer and Kyo-Shin-An Arts, the 16-minute, three-movement work is scored for shakuhachi flute and string quartet. Schlefer, joined by the Colorado String Quartet, premiered the new piece on April 21st at the Kennedy Center in DC. The New York premiere takes place on May 5th at the World Financial Center, and this time, Schlefer will be joined by the Voxare String Quartet. Moravec’s May events don’t stop there — he also has three world premieres! 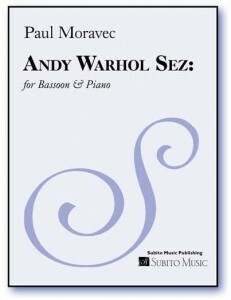 On May 8th and 9th, the San Antonio-based SOLI Chamber Ensemble (who premiered Moravec’s Grosse Fuge Fantasy back in January) offers the first performances of a new version of the composer’s popular Andy Warhol Sez, set for bass clarinet and piano. On the 12th, conductor James John and the Cerddorion Vocal Ensemble premiere Stava il Sole in Brooklyn, NY. Based on texts by Dante Alighieri, Stava il Sole quickly receives a second performance in Manhattan on the 20th. Moravec’s third world premiere, Three Songs of Love, takes place on May 16th and will be performed by soprano Sarah Wolfson and the Mendelssohn Piano Trio. Commissioned for the 30th anniversary of the Market Square Concerts series in Harrisburg, PA, Moravec’s 15-minute work features texts by Lucy Miller Murray—series founder, chamber music author and advocate. More May news: violinist and new music-champion Hilary Hahn visits Switzerland and Italy as she continues her European premiere tour of Moravec’s Blue Fiddle—and Baltimore’s Evolution Contemporary Music Series features Moravec’s Pulitzer Prize-winning Tempest Fantasy on the 9th.